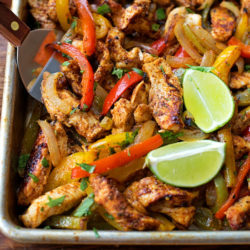 With the new year here I’ve been trying to come up with a few healthy recipes for our family, ones that we can make time & time again. 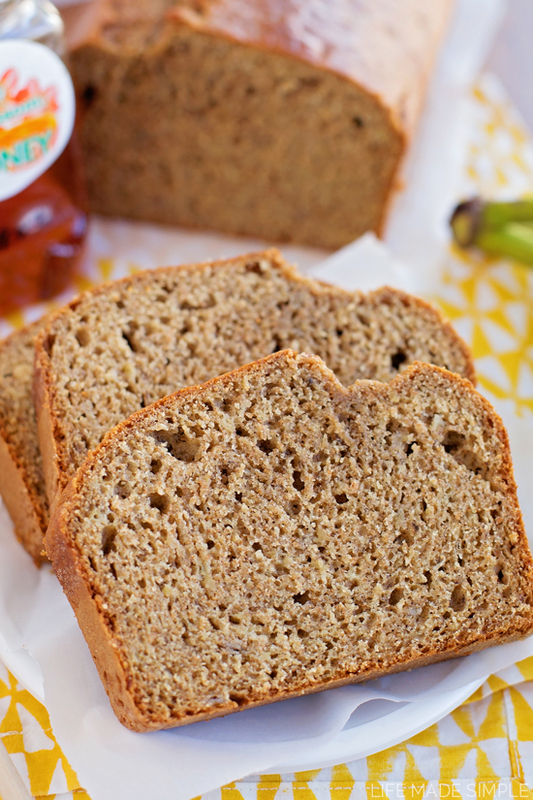 This honey whole wheat banana bread is definitely one of them! I’ve always loved whole wheat but I don’t usually love when things are 100% whole wheat. 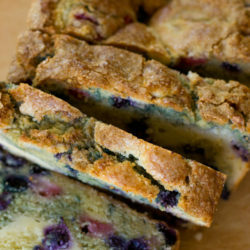 It’s often overpowering, makes baked goods too dry or just looks unappealing. But ever since I made these banana pancakes I’ve completely changed my mind! 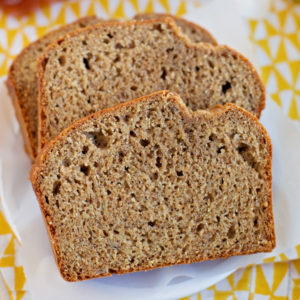 You’d never be able to tell that this banana bread is 100% whole wheat! Obviously if you bake with white whole wheat flour it will be a lot less obvious, but in a blind taste test it would be really tough! Thanks to a few wholesome ingredients, this bread is dense, moist and incredibly flavorful. So are you ready to get started?! To start you’re going to need 3 or 4 really ripe bananas (1 1/2 c. mashed). I’m taking they’ve been sitting out on your counter for about a week and look like death. The riper the bananas the sweeter the bread will be. 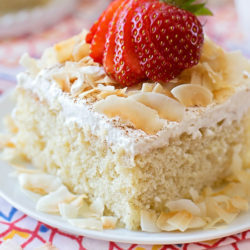 Natural sweetness is what we’re going for here! Next, you’re going to need some honey and oil. I’ve tried both coconut and canola, it’s just a personal preference (see NOTES to sub oil for applesauce). Combine the honey, oil and banana along with some pure vanilla extract and combine. Then add two eggs and mix just until combined. In a small mixing bowl whisk together the whole wheat flour, baking powder, baking soda, salt and cinnamon. Whisking will ensure an even distribution of dry ingredients and replaces sifting… and since I don’t own a sifter I prefer whisking dry ingredients in all my recipes 🙂 Alternate adding the dry ingredients to the wet ingredients along with some Greek yogurt. You can get fancy and use flavored yogurt if you prefer, I just love Greek for the added protein. 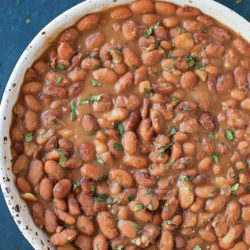 Once everything has been gently combined (make sure not to overmix it), pour into a prepared 9×5 loaf pan and place in the oven to bake for 35-45 minutes at 350 degrees. The time will vary depending on your oven and altitude. Just keep an eye on it and when the top springs back you’ll know it’s done (it may take a few minutes more). Once the bread is cool slice and enjoy! 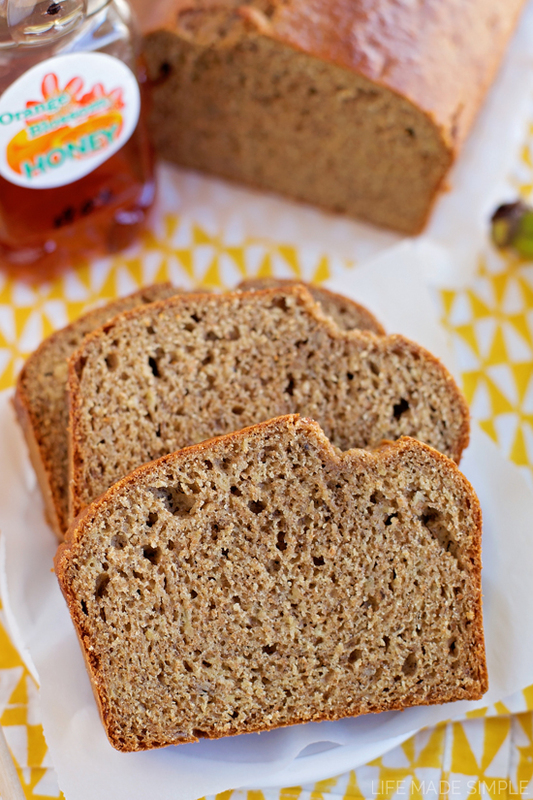 Our family loved how flavorful this bread was and I loved that it was full of healthy ingredients! You could hardly tell that there was whole wheat in there, and everyone went back for a second slice… I call that a success! 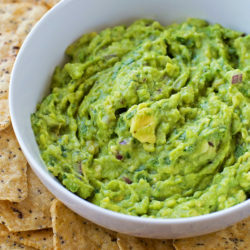 Next time I’m going to try tossing in some chopped walnuts or maybe even adding some blueberries to it! 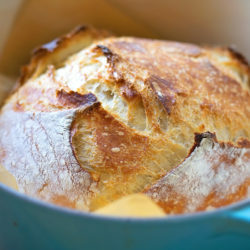 This bread is so versatile and can be altered to suit almost any personal taste! Enjoy!!! 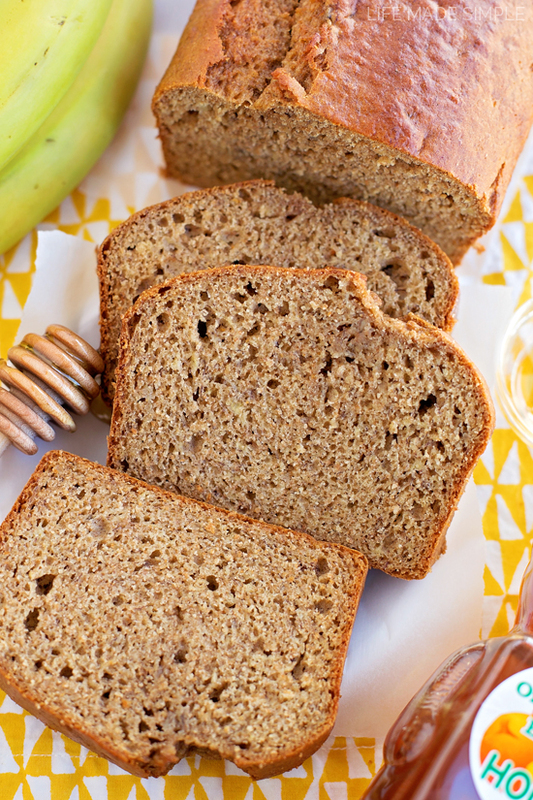 This moist and dense Honey Whole Wheat Banana Bread is naturally sweetened and packed full of wholesome ingredients. You'd never guess that it's healthy! Preheat oven to 350 degrees. 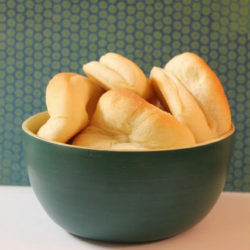 Lightly spray or butter/flour a 9x5 loaf pan, set aside. In a large mixing bowl or the bowl of a stand mixer, combine the honey and oil. Add the banana and vanilla, mix until combined. With mixing speed on low, add the eggs one at a time and mix just until combined. In a small mixing bowl whisk together the whole wheat flour, baking powder, baking soda, salt and cinnamon. With mixing speed on low, gradually alternate adding the dry ingredients and the yogurt, mixing just until combined. DO NOT OVERMIX! Pour batter into the prepared pan, place in the oven and bake for 35-45 minutes, rotating half way through (Note you may need to let it bake a few minutes longer, but at high altitude mine took 42 minutes). Allow to cool in the pan for 10 minutes before transferring to a wire rack to cool completely. *Honey can be substituted for brown sugar. **Coconut oil or vegetable oil can be substituted for a ½ c. of unsweetened applesauce. 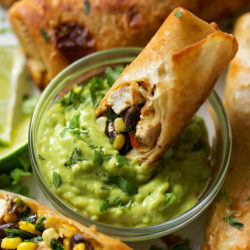 Hi, can I use regular plain yogurt instead of greek and do you bake in conventional or convection setting? Definitely! And just conventional, although you could probably do it on convection too (it may bake a little quicker though). Hope that helps, enjoy! This was fabulous!!! I put it in a round cake pan an decreased the time of cooking to 35 m and it made for a perfect cake for my one year old!!!!!! 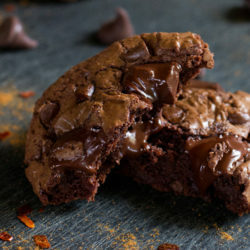 So moist and tasty! I think the greek yogurt is the magic ingredient! Oh, and I can’t make banana bread without adding walnuts–just too darn good.